Jarome Iginla said Thursday that he's leaving Calgary with mixed emotions after the longtime Flames captain was traded to the Pittsburgh Penguins. 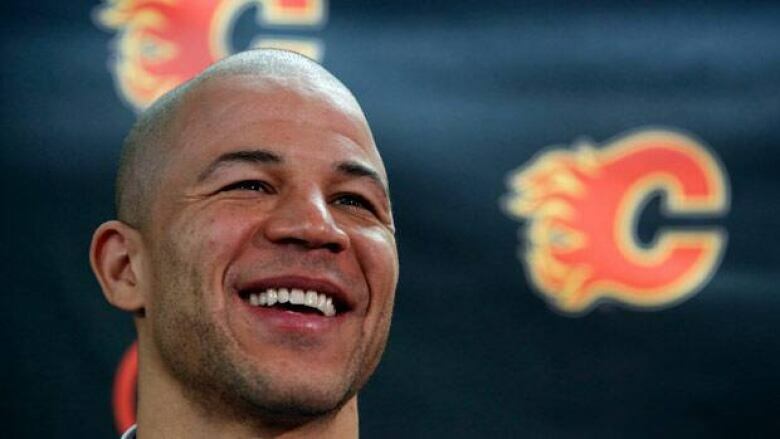 Jarome Iginla said Thursday that he's leaving Calgary with mixed emotions. The Flames ended months of speculation on Wednesday night by trading their longtime captain to the Penguins for U.S. college forwards Kenneth Agostino and Ben Hanowski and Pittsburgh's first-round pick in the 2013 NHL draft. "To leave is tough, but I'm also very excited about the opportunity to go to Pittsburgh," Iginla said at a news conference at Calgary's Scotiabank Saddledome. Iginla has played all 1,219 of his NHL games with Calgary, recording 525 goals to go along with 570 assists for 1,095 points. He has been captain of the Flames since 2003-04. He earned several accolades while with the Flames, including the Rocket Richard Trophy (twice), Art Ross Trophy, Lester B. Pearson Trophy and Mark Messier Leadership Award. "I never would have dreamt I would have played here this long." Iginla said, calling Calgary a great place to live and raise a family. Iginla was scratched just before Wednesday's win over Colorado, ending a consecutive games played streak at 441. Iginla, who had a no-trade clause in his contract, said Flames general manager Jay Feaster presented with three offers made by other teams. It is believed that Boston and Los Angeles were the other aggressive suitors. Flashing his trademark smile, Iginla wasn't entirely comfortable talking about his legacy in Calgary, pointing out to reporters on more than one occasion that he doesn't plan on retiring anytime soon. The deal reunites Iginla with Penguins captain Sidney Crosby, who scored the overtime winner in the gold-medal game at the 2010 Vancouver Olympics on on a play set up by Iginla. Iginla said it was hard to pass up the opportunity to play with the likes of stars Crosby and Evgeni Malkin, and given a lockout schedule that has teams only playing within their conference, he won't be playing in Alberta for the next several months. "It's nice to kind of go East for this really short term and not have to play against [Calgary] because it would be a little weird and I can just cheer for them and not have to think we're battling for the same playoff spot or anything like that," he said. The team captain said his wife and children are currently on a family vacation in Hawaii, but were excited for the deal. Iginla is looking to be part of what would be only the second long playoff run of his career. He made his debut with the Flames in a 1996 playoff game but overall he's appeared in a modest 54 playoff games. Nearly half of those are accounted for by Calgary's 26-game run in 2003-04. The Flames lost in seven games to Tampa Bay in the Stanley Cup final. "It still stings but it's a great memory," he said, harkening back to the assembling of fans along The Red Mile. Calgary made the playoffs in just five of Iginla's 15 full seasons with Calgary, and not since 2008-09. "I wish we had more success over the past few years, but I'm happy that we tried," said Iginla. "I know it wasn't lack of effort from the organization," he added. The man who came to embody the No. 12 jersey came to the organization in a December 1995 trade with Dallas while still a prospect. The Stars had selected him 11th overall in the draft that year. He will turn 36 in June and can become an unrestricted free agent the following month. The collective belief is that the Penguins would have to be pretty creative given their commitments in order to retain Iginla next season and beyond. He's completing a five-year deal worth $35 million US. Iginla said while the Flames are retooling, they still have a shot at making this year's playoffs, something he hopes to see happen. Calgary will begin that huge assignment in the first game without Iginla on Friday night at the Saddledome against Columbus. However, Feaster is likely unfinished in remaking the roster ahead of next Wednesday's deadline.